A new Florida Atlantic University survey finds Governor Desantis’ popularity increasing relative to February (54% approval in March vs. 48% approval in February). President Trump’s approval has also risen compared to February (43.6% approval in March vs. 41% approval in February). In addition, 35% of Floridians find President Trump very responsible for the recent rise in hate crimes, 20% somewhat responsible, 37 % not responsible and 5% not sure. The poll was conducted March 22-24 of n=500 registered voters, +/-4.3%. 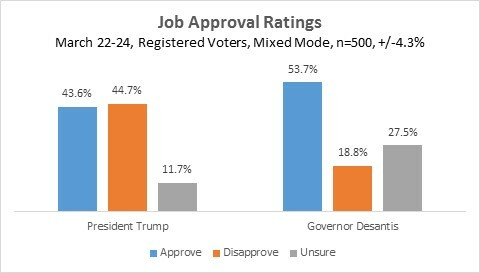 DeSantis struggles with Democrats with a 31% disapproval and 37% approval but Independents like what they see so far in their new Governor with a 51% to 12% approve/disapprove and Republicans approve 72% to 11% disapprove. The most popular public policy asked about in the survey is allowing Florida to import prescription drugs from Canada in an effort to lower prescription costs to Floridians; this had 75% support and 12% opposition (+63). This has the strongest appeal across all demographics including gender, party affiliation, race, age, education, and region. The creation of a task force to reduce the impact of the harmful algae blooms was the second most popular policy; this had 63% support and 16% opposition (+47). The third most popular policy was the expansion of school voucher programs for middle-income families; this had 52% support and 29% opposition. The greatest support comes from 18-29 years old with 60% support and 26% opposition and 30-44 years old with 62% support and 18% opposition. Overall, 49% of Floridians support a ban on all forms of fracking (also known as hydraulic fracturing) to explore for oil and natural gas in Florida while 31% oppose it. Among Democrats, 61% support it and 24% oppose it. Among Republicans, 39% support it and 39% oppose it. Among Independents, 44% support it and 29% oppose it. Overall, 46% of Floridians support a law banning sanctuary cities to prevent local governments from passing ordinances that limit cooperation with federal immigration authorities, while 34% oppose it. Furthermore, among Democrats, 27% support it and 50% oppose it; among Republicans, 69% support it and 18% oppose it; and among Independents, 43% support it, and 33% oppose it. Overall, 38% of Floridians support allowing teachers to carry firearms on school property while 50% oppose it . In addition, 49% of males support it while only 32% of females support it. 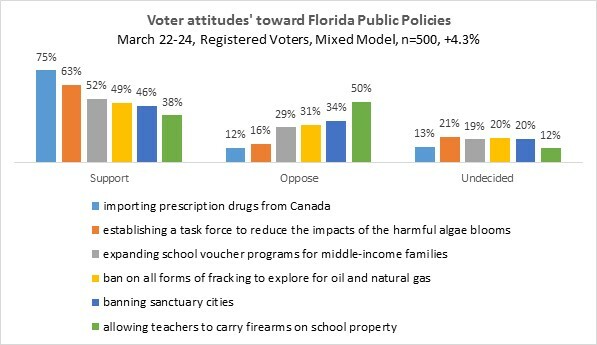 The FAU BEPI Florida poll was conducted March 22-24, 2019. The sample consisted of registered voters, n=500, the poll’s margin of error (MOE) of +/- 4.3 percentage points. The data was weighted by age, party affiliation, and gender based on a 2016 voter model. It is important to remember that subsets carry with them higher margins of error, as the sample size is reduced. Data was collected using both an Interactive Voice Response (IVR) system of landlines and an online panel provided by Survey Sampling International, SSI.